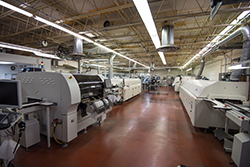 Electronic Manufacturing Services Rochester, NY │ Control Panels – PCB Assembly │ SCJ Associates, Inc.
SCJ Associates provides a wide range of manufacturing services. We will collaborate with you in the early design stages for DFM/DFT, build your prototype using our automated processes and streamline it through production quantities. Depending on your needs, choose one of our services or a project that encompasses them all.